In the Upper Midwest we went from riding dirt in our shorts to riding groomed singletrack in our Wölvhammers in a matter of a few weeks. In Minneapolis we got a few inches of snow, but up north they received more than 10 inches in most places. We heard that the volunteers at the Woolly Mountain Bike Club in St. Croix Falls, WI had been grooming their singletrack trails all week, pulling a custom grooming device (aptly named “Bjorn”) behind a vintage Skidoo Skandic snow machine. By the sounds of it, the trails were going to be exceptional by the weekend so we headed up to check them out for ourselves. Friday evening we connected up with Frank Lundeen from local 45NRTH dealer, Cyclova XC. He has been instrumental in bringing people together in the St. Croix River Valley to build new trails, create and host events, and build an active outdoor culture in the local community. 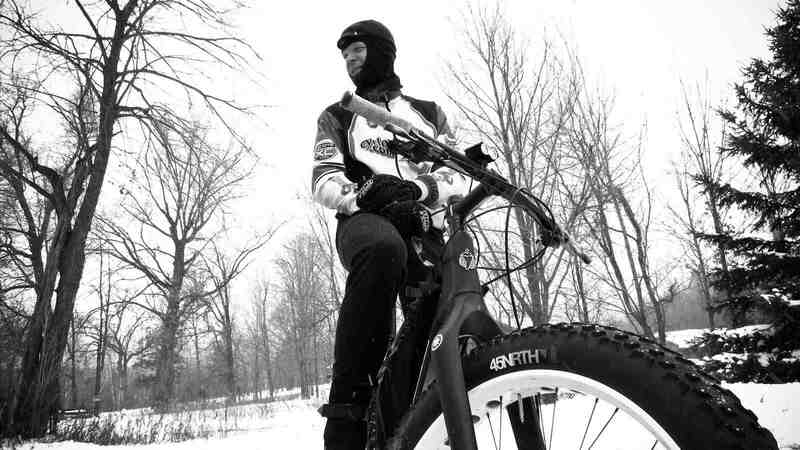 Next month Frank and his team of volunteers will be kicking off this years Great Lakes Fatbike Series with the 2nd Annual Solstice Chase fatbike race. Frank Lundeen - Cyclova XC. Friday evening we had a few local brews with Frank and talked about the surface condition of the trails. We came armed with tires for testing and wanted to be sure we were making the right selection. From the sounds of it, the surface would be quite firm considering it was the first snowfall of the season. Tires were mounted, clothing gear was prepared, and coffee was staged. The next morning we were greeted to some fantastic winter sunshine. Winter, sunshine, and morning coffee. The thermometer read -3°F at 8am and we were hungry. The plan was to grab some breakfast and sort out a basic ride plan. As we cruised down main street our breakfast needs were easily answered. 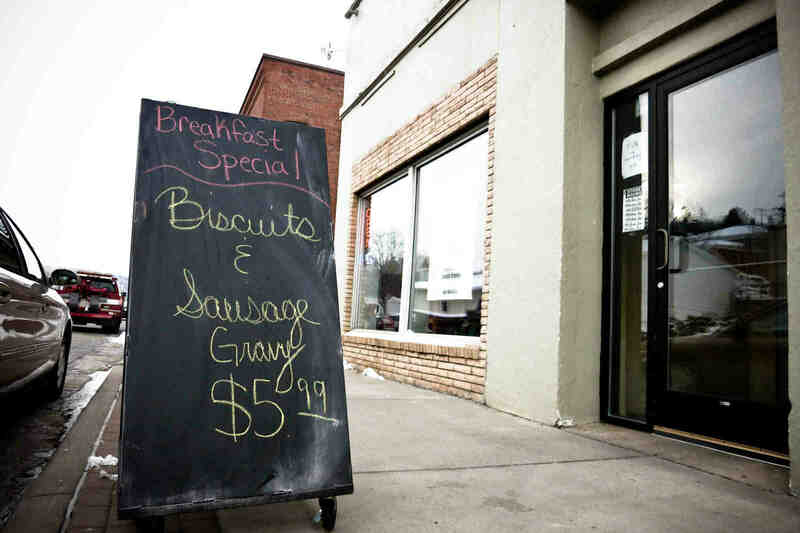 Nothing says winter cycling fuel like biscuits and gravy! As we stuffed our faces with biscuits and gravy, Frank filled us in on more details about the trails. Nearly all of the singletrack had been groomed, including the new Erratic Rock flow trail that opened in late October. The idea of riding a freshly groomed flow trail sounded amazing. Looking at the new winter version of their MTB trail map, it made most sense to start at the trailhead and ride more or less clockwise through the trails. The Gandy Dancer trail dissects most of the singletrack into east and west units. 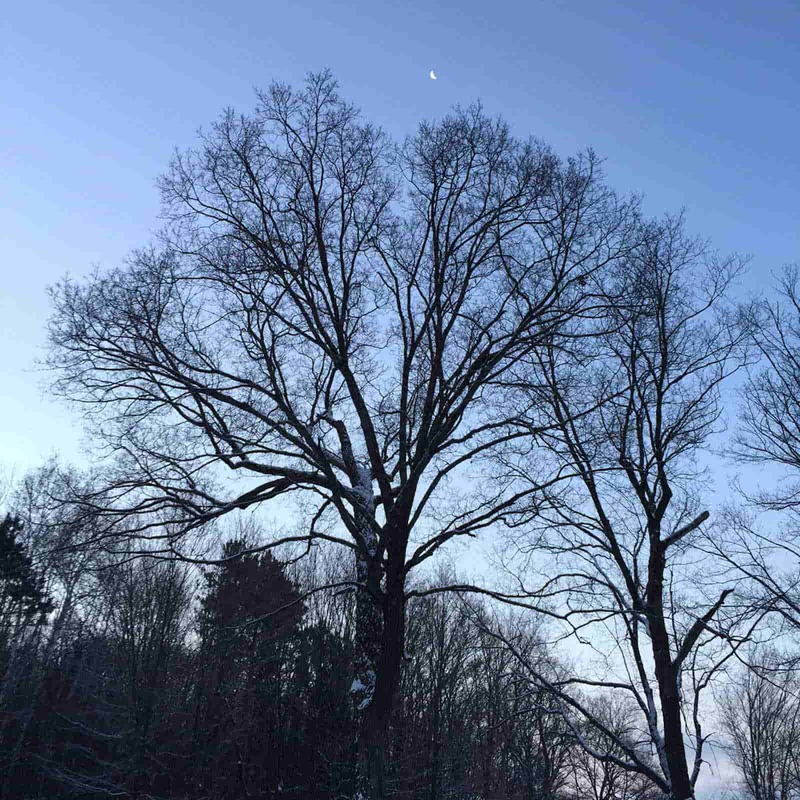 To connect Wissahickon and Big Oak you get a few minutes of respite as you ride back down the Gandy Dancer Trail. These trails are built on a massive moraine, with steep ups and downs on top of ancient rock bed. 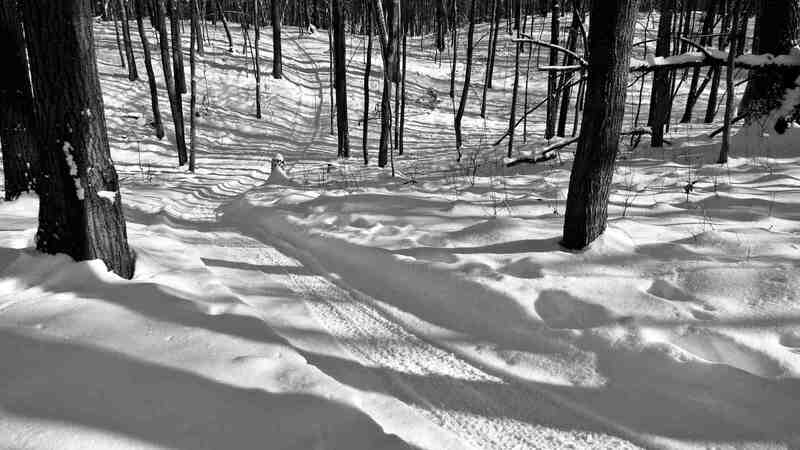 Having a bit of respite comes in handy after riding each of these groomed singletrack sections, especially Wissahickon. As you can see with Erratic Rock, the new flow trail, there is an out-and-back connector, making it possible to easily do multiple laps of this super fun trail. By the time we got to the trailhead it was around 5°F. As we were rolling out towards Lower Meadow you could see other people showing up with fatbikes to check out the freshly groomed trails. Because fatbiking and groomed singletrack are still very new, the trails were marked with “snow bikes only” at each of the entry points to inform people that walking on groomed trails is damaging. It was great to see all the effort that has gone in to keeping the trails in excellent condition. We got out into the trails and experienced sublime winter riding conditions. It was hard to believe that conditions could be this great in the middle of November. There was a light dusting of snow on top, but the base was solid like styrofoam. It was early in the day and we saw lots of Dillinger and Hüsker Dü tracks already. Shortly after the switchback section of Big Oak there is a long wooden built-in that we rode over and over. Long swooping switchbacks at the top of a hill near the Riegal Park section tested our physical strength and climbing traction. We all had excellent traction, with different levels of physical strength, but we were all having an absolute blast on the perfect trail conditions. A bench-cut section of trail leads you into the Erratic Rock flow trail. Glowing afternoon sun gave way to a clear evening sky. St. Croix Falls has really got it going on with winter cycling. 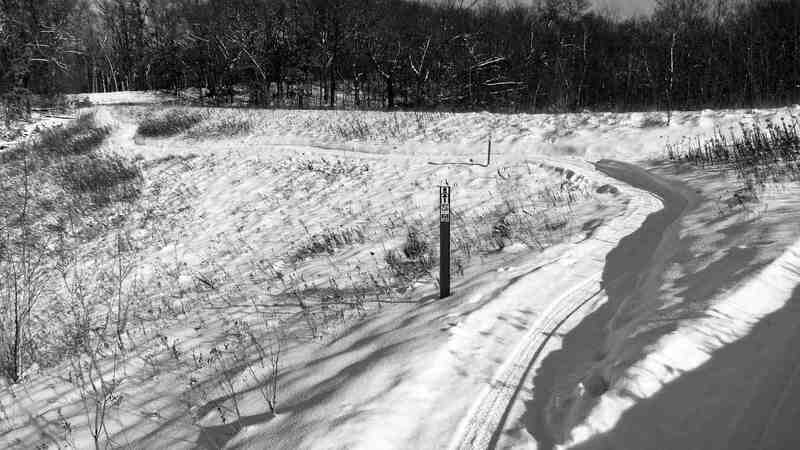 The Woolly Mountain Bike Club has made a fantastic winter riding experience possible just a one hour drive away from Minneapolis. A special thank you goes out to Frank Lundeen of Cyclova XC and Bjorn the trail groomer for making a most excellent winter cycling weekend possible. 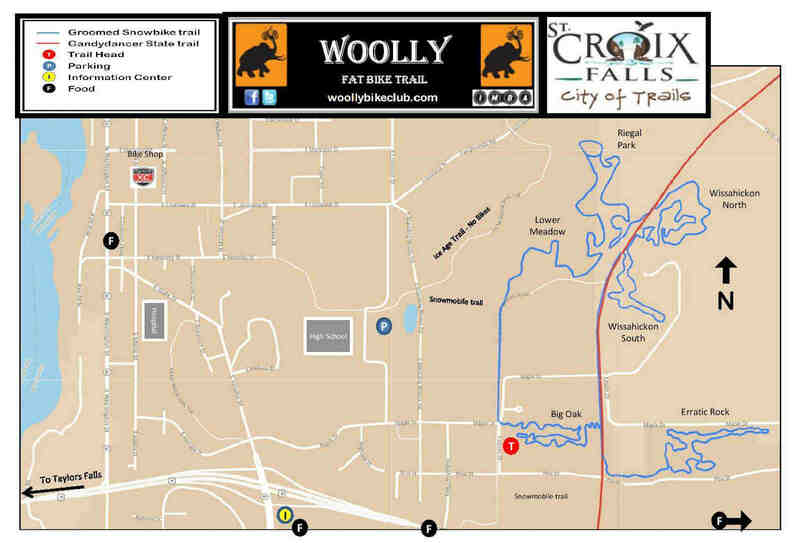 We highly recommend getting up to St. Croix Falls as soon as possible to check these trails out. You won't regret.